Soul Control, meet your new best friend, as your old one just got kicked in the face. We've all seen a million netdecks of Soul Control already. Soul exchange, tribute for Mobius, blow away 2. Soul exchange, tribute for Thestalos, smack your hand for 1. But oh wait, now there's Dark World! If you hit their hand, you could be in for a horrible swing of advantage the other way. People probably won't play Thestalos now...so they turn to this, as 3 Monarchs just aren't enough with that deck. Zaborg is a 1:1 just like Thestalos, but you have to be more careful with this one. There has to be another monster for Zaborg to destroy, otherwise he ends up destroying himself. He's still second-best to Frosty but it's still a way to either get rid of an opposing card. Coin Flip Zaborg the Thunder Monarch has waited a while since his prior review… There, he wasn't really a topic of interest among the players. While he was teched in here and there, Airknights were better LIGHT monsters to tech in that were more worth their cheese. 2005, enter Soul Control. Every Monarch is more playable now. Zaborg receives occasional consideration for being a good card here and there. The third banlist arrives at the U.S., and finally people begin to randomly tech him in again as a better LIGHT, ironically, than Airknight Parshath. He is a solid monster that can kill any monster on the field period with only the activation condition to worry about and still hit up on one or two more. While he does take up your summon, like Exiled Force, he doesn't require an attack like DDWL, MSLV2, Drillroid or D. D. Assailant, and he leaves you with a monster afterwards. A solid midgame card like all the other Monarchs… Just moreso than some others. Maybe we'll see a bit more of this beast in the game. It's a bit situational, since it requires that YOU have your monster on the field at the same time your opponent has his monster on the field to work at its best, but hey, it's still worth its salt. Dark Paladin Zaborg the Thunder Monarch is the best Monarch in my opinion with the exception of Mobius who reigns supreme (my opinion remember). Zaborg has an excellent 2400 attack which matches the norm for your one tribute monster. He is also Light which doesn't really matter anymore. He has a 1000 Witchable (traditional) defense. Finally, he has a rather nifty effect. When this card is tribute summoned successfully, you must destroy one monster on the field. Your opponent has a Jinzo, Airknight, or even a pesky face down threat and Zaborg nukes it for good. The only real downside is that if you tribute for him and it's ALL you have, he kills himself. Ahh, one of my favorite monarchs in this game. When I found out about Mobius the Frost Monarch, I didn’t realize there were multiple Monarchs with “come-into-play” effects. What I’m talking about is that Mobius the Frost Monarch COMES-INTO-PLAY with an effect, meaning that when it’s summoned and not countered, you’ll benefit from its effect. Now I was very intrigued by this effect. I play another TCG game called Magic the Gathering and “come-into-play” monsters are highly valued in that game also. I found out about this card when I was searching through a card database and looked up Monarch. I found out about Zaborg. FIRST thing I realized was its amazing attribute: LIGHT! Anyone remember a broken card called Black Luster Soldier – Envoy of the Beginning? Back in that format, it seemed like Lights were harder to attain than Darks. Second, I realized that it’s a monster removal. Now in MOST CASES, Monster removal is better than spell/trap removal (ie: Mystical Space Typhoon compared to Smashing Ground or Dust Tornado compared to Sakuretsu Armor). Third and finally, I realized that it didn’t matter if the monster was face up or face down; it’ll destroy the monster regardless. So there’s a brief background on how I met this wonderful monster. Remember the Strike Ninja deck? It was based on getting D.D. Scout Planes into the Graveyard and then abusing Tribute monsters to keep repeating the Strike Ninja cycle. 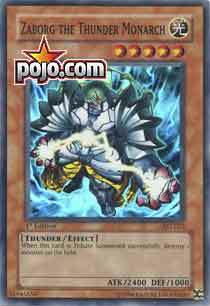 One of my favorite monsters for that deck was Zaborg the Thunder Monarch. If you can tribute Zaborg without getting it countered, you didn’t have to risk a Bottomless Trap Hole or Sakuretsu Armor to destroy your target. Now Zaborg is in my opinion a “staple” in most Strike Ninja decks because of the synergy. Zaborg in other decks? Well lack of facedown removal provided in this format, as I explained in the prior Card of the Day, makes this Monarch very playable. I have to warn you guys that Zaborg the Thunder Monarch’s effect is mandatory, meaning you MUST choose a target when Zaborg is summoned. So if this is the only monster on the board after the tribute summon, then you must choose Zaborg as a target. I suggest everyone tinker with this card in a deck or two. The game-breaking advantages you could achieve with this card is amazing and worth a try. Bob Doily K, so how to start this off? It’s been a while since I’ve actually done a single card review, but meh, here I go. So we’re looking at Zaborg the Thunder Monarch. First off let’s look at the stats, LV 5……eww… a tribute(go figure they make too many of those) with 2400/1000. So solid statistics for the current meta. Thankfully it bypasses the 2100 mark set by Cyber Dragon, if it didn’t have over that it would need a seriously broken effect to make it worth fielding. The 1000 DEF is low for modern standards compared to some higher level monsters such as Cyber Dragon (go figure) and Jinzo, which means that it will have the added vulnerability to Tsukuyomi and Book of Moon, but with them restricted it might not be so bad. Now let’s look at the effect, when this monster is successfully tribute summoned, destroy one monster on the field. K so that means that if the opponent has no monster that this card is a dead card in your hand. Cause it can kill itself and that would be plain stupid. So essentially this monster on the base level is a 1:2, expending the monster on your field and it from your hand to destroy 1 card. It evens out though since he himself becomes a monster. So this card can be run as a random tech in Chaos (it’s Light) or in aggro decks. Really though this is best suited for Soul Control decks as everyone has probably mentioned since they are based on tributing something of the opponents to get an effect to generate advantage. So really this works well in there to punish other decks that over extend, which thanks to Cyber Dragon many do. Then again people still in the past have preferred Thestalos to Zaborg, although that is changing, not really thanks to Dark Realm, because they are too unstable to play, but thanks to plays having to extend more on the field while getting a lower hand size early. My personal preference is to run Zaborg over Thestalos now. Along with Brain Control over Soul Exchange so that I’m not sacrificing my Battle Phase.